Do you know what S/PDIF stands for? Yes? Then you probably don’t need this tutorial. This is for everyone else. Sony and Philips, a long long time ago, came up with a cool way of transmitting CD-quality digital audio called S/PDIF (Sony/Philips Digital Interchange Format). You sometimes see it on the back of older DVD players or receivers, and on USB audio interfaces for the computer. Well, I guess you could go pretty far and never use S/PDIF, but because I just troubleshooted a system that used it, you get to read about it! Optical audio is certainly cool, but the fine folks at Sony and Philips thought they could do it an easier way. S/PDIF just uses plain jane old regular RCA cable. This cable sends an encoded pulse of data (think the noises an old modem might make but different), which gets decoded on the other end. The efficiency of S/PDIF is that it can be used to send multiple channels, such as stereo or 5.1 surround over only one cable, rather than over many. Speaking of the one cable…can’t you just use a regular old RCA? 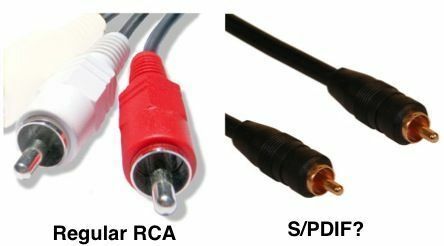 The pros say no, and in most cases they’re right…a regular RCA cable is too noisy for a digital signal, though in a pinch component video cables might do the trick. Now when you see a S/PDIF jack, you will know what to do with it!